In a medium saucepan over med. high heat, bring 2 cups sugar and 2 cups water to boil, then reduce heat and simmer 5 minutes. Remove sugar syrup from heat and let cool. 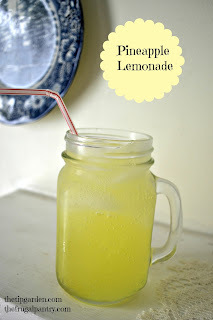 In serving pitcher combine sugar syrup, pineapple juice, lemon juice and water or club soda.